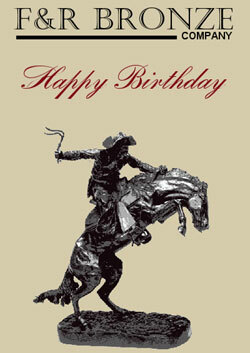 We can give that special someone a gift certificate and custom card from F&R Bronze with your customized message. This is great when you are having a problem finding that perfect gift. They can shop on our website and choose from over 1000 different bronzes. Email or call us for a different amount not listed above. "Give a gift that lasts a lifetime with the symbol of enduring quality, a handcrafted bronze sculpture."